An article briefly tracing the history of Alternative Libertaire's predessor group, the Union des Travailleurs Communistes Libertaires. One of the most important factors in the birth of Alternative Libertaire (AL) was the Union des Travailleurs Communistes Libertaires (UTCL - Union of Libertarian Communist Workers). This organization, which lasted for 17 years, had made strenous efforts to maintain a libertarian orientation in the class struggle of its day. But before becoming an organization as such, the UTCL was a tendency with the Organisation Révolutionnaire Anarchiste (ORA - Anarchist Revolutionary Organization) 1. In the wake of 1968, the ORA had attracted numerous young people who were put off by the Leninist, Trotskyist and Maoist organizations. If we must characterize the political project of the ORA, let's say it sought to build an organization for "workers' anarchism". To references to Marxism increasingly accepted there was added a desire to be involved in labour, which resulted in the publication of bulletins for various industrial sectors. Two of them were to last for some time: "Le Rail enchaîné"2 at the national railway compny SNCF, and "Le Postier affranchi"3 at the Post Office. Animated by young employees, they were witness to what, in the eyes of some, was the ORA's best point. On the other hand, while hopes of an imminent revolution faded, the majority of the ORA began an evolution that would lead it to break with this workerist approach in preference for the sort of movementism preferred by the Italian autonomists. 1974 saw big strikes by bank workers, in the post office and the SNCF, three sectors where the ORA had militants. For those who were behind "Le Postier affranchi", the case was clear: they had to be part of the mass struggles, supporting them through union work which must be part and parcel of the work of revolutionaries. They were joined in this analysis by others, in particular railway workers. A militant nucleus was formed, which would become formalized into the Tendance pour une Union des Travailleurs Communistes Libertaires 4. The struggle of the tendency within the ORA did not last long, given their differing strategies and organizational ideas. At the Orléans congress in April 1976, the UTCL minority was expelled and the majority of the ORA took the new name Organisation Communiste Libertaire (OCL - Libertarian Communist Organization). 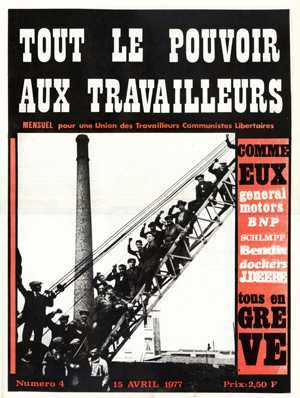 The first issue of "Tout le pouvoir aux travailleurs" 5, official journal of the UTCL, was already at the printers, the somewhat ironical headline being "Another little group!". The break is completed with the OCL, which moves in a more anti-syndicalist direction, while the "Basic Principles" passed by the 1st Congress of the UTCL in 1978 require militants to be members of the CGT or the CFDT 6. The members of the UTCL devote a large part of their work essentially to the CFDT, which was in favour of self-management). Bulletins in various industrial sectors multiplied, with varying formats and regularity: "Le Postier affranchi" in the post office, "Le Court-circuit" in Électricité de France7, "L'Éclateur"8 in Air-France and "Cheminots en lutte"9 in SNCF. But the young organization soon had to deal with the economic crisis and the crisis in activism. The early 1980s heralded a period of decline in the struggles. May 1968 was a long way away and most of the far left was going downhill. What was the UTCL's strong point - being rooted amongst the workers and the choice of union work as the everyday alternative to rampant individualism - was also its weakness. In effect, it was difficult for the UTCL to build "the workers' organization for libertarian communism" when it had not reached a critical mass of members, and when among those there were so many who had received union mandates from their workmates which they could not decently refuse. But this did not prevent the UTCL from engaging in specific tasks, such as support work for workers in Eastern Europe. This would culminate in the organization of a symposium called "1921-1981: From Kronstadt to Gdansk - 60 years of resistance to State Capitalism", which saw the participation of noted dissident Soviet trade unionists Ante Ciliga and Marcel Body, as well as historians Marc Ferro and Daniel Guérin, himself a member of the UTCL. In May 1982 "Lutter!" took the place of "Tout le pouvoir aux travailleurs". Both in the press and in the organization itself, strategic analysis on trade union and labour work takes the high ground. Naturally, the UTCL continued with its public campaigns: in support of the Kanak people, the struggles in Eastern Europe, for the bicentenary of the French Revolution and against the war in Iraq. But the reality of the UTCL as an organization is increasingly that of a network of seasoned syndicalists, best known in "informed" circles. In its politicaltestament in 1991, the UTCL would describe itself, tongue firmly in cheek, as an "involuntary Bakuninist alliance", in reference to the secret societies so dear to the famous Russian anarchist. If proof be needed of its influence in this area, there was the public meeting organized in 1986 by the UTCL on revolutionary syndicalism, which saw the participation of 400 people, a good number of whom would several years later become key figures in the new alternative trade unions SUD, SNPIT and CRC 10. The UTCL network fought against the re-centralization of the CFDT which was at time exchanging self-management for negotiation. It was in this framework that it published the "Projet communiste libertaire" ("Libertarian Communist Project"), a dense paper 11 adopted by the 4th Congress of the UTCL in March 1986. It defines the concept of "anti-authoritarian coordinator for struggle" as an alternative to vanguardism. This idea would be applied very quickly by groups of strikers in winter 1986-87, which UTCL members are very invlved in. And while the struggles recommenced, the forms of activism evolved one way or the other. Thus in 1989, the trade unionists suspended by the CFDT leadership would set up the SUD union in the post office 12. That same year, the UTCL began the process which would lead to its dissolution and the creation of Alternative Libertaire. The UTCL had had its day. However, in addition to building friendships and a common path, it did allow the creation of a militant collective over a period of seventeen years, which built up a strategic and political coherence which was an important legacy for today's libertarian movement. Article published in "Alternative libertaire", N°207 - June 2011. Translation by FdCA-International Relations Office. 1. On the ORA, see the interview with Rolf Dupuy and Guy Malouvier in "Alternative libertaire", May 2008. 2. Translator's note: "The unchained railways". 3. Translator's note: "The emancipated postie". 4. Translator's note: "Tendency for a Union of Libertarian Communist Workers". Author's note: Les dix-sept années de l'UTCL, collective review produced in 1991 for the 5th and final congress of the UTCL (available in French at Raforum.info). 5. Translator's note: "All power to the workers". 6. Translator's note: Confédération Française Démocratique du Travail. 7. Translator's note: "The Short Circuit". EDF is the national electricity provider. 8. Translator's note: "The Spark Gap". 9. Translator's note: "Railwaymen in Struggle". 10. See "1988, des moutons noirs fondent SUD-PTT" in "Alternative libertaire", October 2008. 11. See the partial republication of this text by AL: Un projet de société communiste libertaire. 12. Patrice Spadoni, "Rayon de SUD, les dix ans de SUD-PTT", interview with Annick Coupé and Martine Donio, in "Alternative libertaire", January 1999. Saw this in French in the AL publication. Thanks FdCA for the translation (and Juan posting). For many years we (in NY) would get UCTL publications. While we never had any working relations with them or shared their politics, they were always interesting to us. Anyway, I dunno, I thought the section in "For An Anti-Capitalist Alternative” on "A Strategy of Counter Power" was something all class struggle anarchists, including anarcho-syndicalists, could basically agree with. "The perspective of workers counter-power, constructed little by little in struggles, is, for the UCTL, the political alternative to the powers-that-be, to the State, to government, to the bosses. -	A united, autonomous, and abiding self-organization of workers against hierarchy, the bosses, technocrats. The Italian factory councils remain a concrete example. -	Elaboration of workers’ proposals by the workers themselves, adopted democratically. The rank-and-file are in opposition to the decisions of the rulers in the workplaces. The workers oppose their arbitrary demands, their conceptions of what should be changed in work conditions, in what is produced, in the organization of the work schedule, and so on. “3. Demands must be developed which will unify the workers (wage-earners and unemployed). These can include [a whole set of immediate demands, but also including “workers’ control of new technologies, of technical choices and research.]. “ A strategy of Counter-Power gives to the workers the role of actors and decision-makers in effecting change. It is opposed to the electoralism of bourgeois democracy, which is founded on the delegation of power to candidates and parties. “In laying the foundations of a long process of permanent change, such a strategy clarifies the everyday practice of moving towards the revolutionary upheaval and a new society which will be self-managed and federalist. For libertarians, autogestion [self-management] is not an ornamental concept, but the cornerstone of socialism. Libertarian socialism.